Feeling under the weather? – A Penny Black card! I have a get well card to share today. I played with the cling stamp set called Feel Well. I LOVE this umbrella and all the doodling on it. So I black heat embossed the image and watercoloured using Zig Markers. Here is my card. I then cut out the watercoloured umbrella. On another card panel, I smooshed some Salty Ocean and Cracked Pistachio distress inks. Then spattered some glitter on it. When dry, I black heat embossed the umbrella and the sentiment on the smooshed panel. Then I layered and foam adhered the cut out watercoloured umbrella on top of the heat embossed image. I covered the umbrella with clear shimmer. 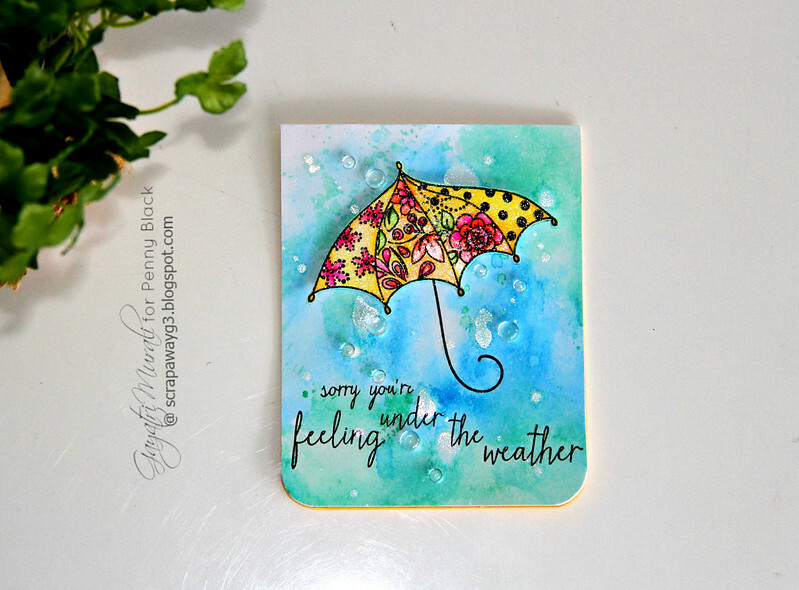 I used my favourite Clear Droplets from Pretty Pink Posh on the card. They are perfect for this card. I adhered the finished panel on yellow card base and rounded the bottom corners. For more gorgeous new products from Penny Black, please visit Penny Black Store. 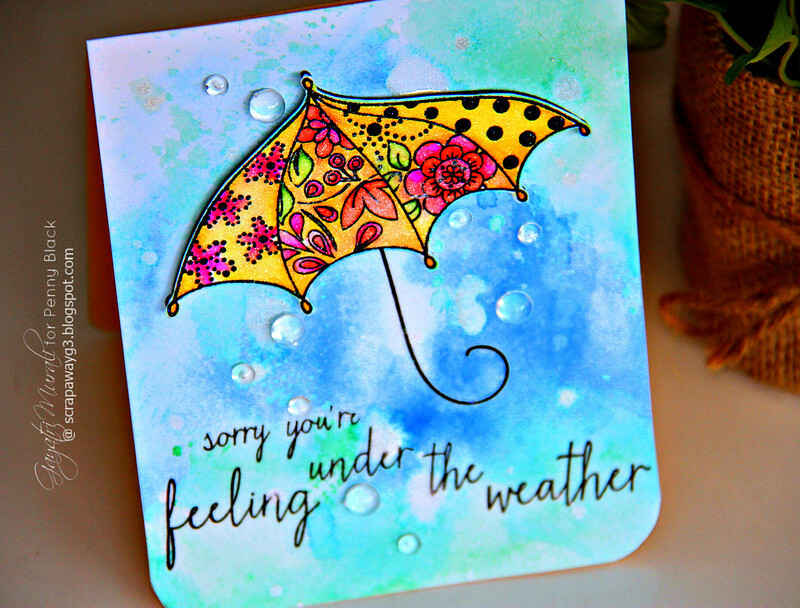 What a gorgeous card…love the background and beautiful floral umbrella. So pretty Gayatri. The beautiful sparkle on the umbrella is awesome. Ever so pretty, Gayatri! 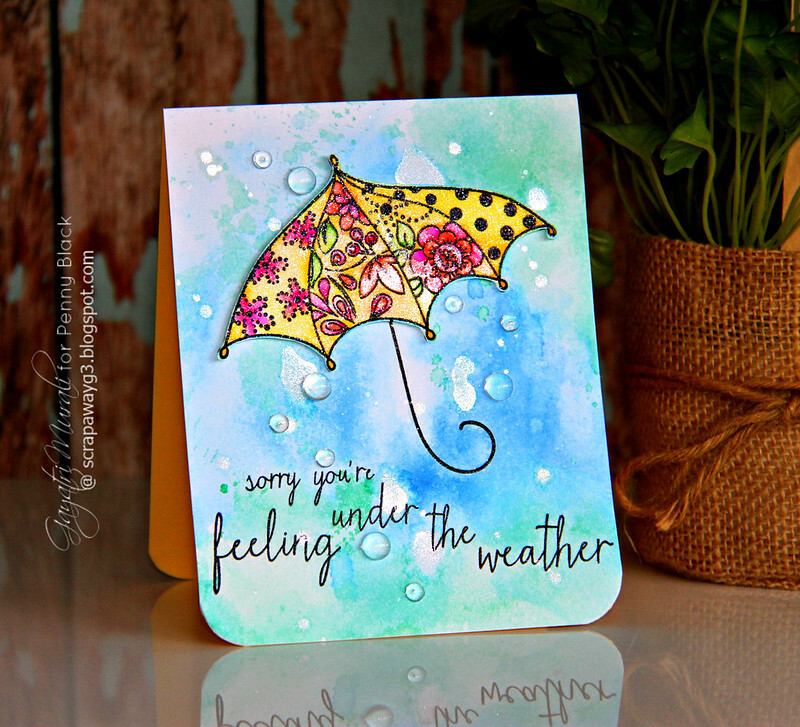 Love all the shimmer and shine, and your background work is perfection! Pretty card, perfect to cheer someone up!